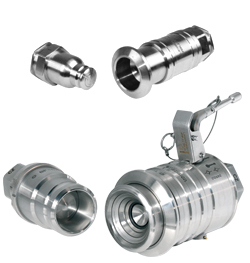 The clean-break couplings of the CP series are our latest generation push-to-connect couplings and are designed for the medium pressure range up to 250 bar. This series is suitable for all applications, which demand minimal leakage, easy handling and a high flow rate. 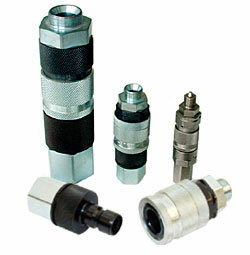 In addition, the optional unlocking safety device (-ST) offers high process reliablity. A connection under residual pressure is possible. 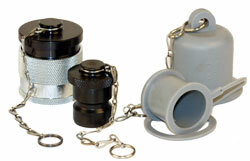 .Also available in an ATEX conforming version. For self-lubricating media, e.g. hydraulic oil. pressure (up to 5 bar) without squirting medium. Can be operated with a hook spanner. 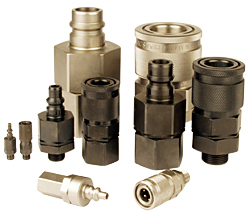 hydraulic applications in the heavy industry. insensitive to pollution and can be cleaned very easy. 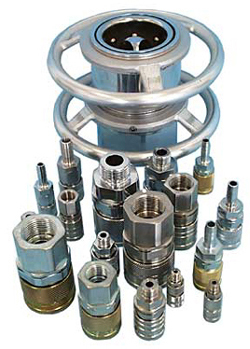 coupling process can be carried out with very low force. 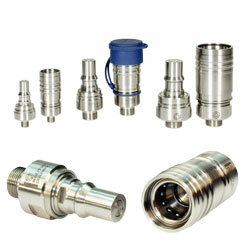 Non-squirting clean break coupling for the application in the pharma industry for the transport of fluids, e.g. Compressed air spiral hoses made of polyurethane are offered in the nominal bores 6,5 to 11 mm with lengths of 3000 to 8000 mm. 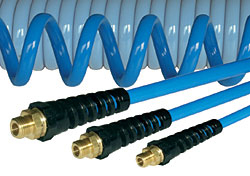 All compressed air spiral hoses are equipped with a rigid screwing and a buckling protection. The scratching-protection secures reliably from damage, as it covers all scratching components includes a hose clamp (for the smooth hose).